I think I’ll start dating. Or maybe not. 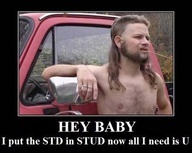 "I put the STD in STUD. Now all I need is U."